An episode from Starbucks history: brewed coffee at Starbucks: At some point I will write a blog entry about the “experience” of “Brew on Demand” and what it means for Starbucks customers. Rather than write one long book-length post on “brew on demand,” I am going to break up the essay into several short chunks. This is the first piece of it, and aptly, it is the background story. Once upon a time, Starbucks sold whole bean coffee scooped from bins. As beans reached close to their expiration, store partners might use the beans to brew for a coffee of the day, or sample coffee via a French press. 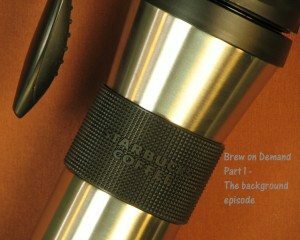 The drip coffee choice on the brew and ready-to-go varied greatly since each store had great control to manage their inventory by brewing through coffee that might be close to its expiration rather than having to toss out expired product. To this day, I actually don’t really understand why this model isn’t adopted in the stores to some degree. I have walked in stores once in a while, and picked up a pound of coffee from the shelf, close to expiration, and wondered why it can’t be brewed as a drip coffee offering. It at least sounds like an efficient idea to me. Coffee beans get delivered to Starbucks stores in large 5 pound bullets, in flavor-lock packaging. The plastic flavor-lock packaging has a special one-way valve so the any carbon dioxide gas emitted from the bean is released, but no moisture gets in. Later, stores went to a variety of coffee offerings that were “coffee of the week” options. Again, store managers had great control over what to order and offer as their stores coffee option. One store might be featuring Viennese Blend (long since discontinued Starbucks Blend) and another might have Sulawesi (discontinued coffee, though it makes limited offering appearances) on the brew. Eventually, coffee of the week became more standardized from store to store. In all honesty, I don’t even know how that happened. However by the late 1990s, early 2000s, each store would usually have the same coffee of the week available, though still not with perfect consistency. So, the picture I leave you with is that for at least two decades Starbucks brewed a variety of coffees in their stores, and the hold times were one hour. As I recall, one would be able to walk into a Starbucks and find decaf all day, coffee of the week all day, and a lighter coffee like House Blend, as the morning brew. Many people think that the lighter roasted coffees like House or some other Latin American coffees would be enjoyable as afternoon coffees. Traditionally though, very light roast coffees have a greater caffeine content than a very dark roast. Some of the caffeine in the beans is lost during the roasting process, and as the caramelization of the bean occurs. Thus, the “mild” light roast Latin American coffees are usually the strongest pick-me-up coffees in terms of caffeine content. That concludes the background story to “brew on demand”: Historically you had a variety of coffees at Starbucks, and one hour hold times. Little interactions: Snippets of Melody’s Starbucks visits. Starbucks Leadership Lessons – Cliff Burrows stories. I LOVED having variety! That’s how I was able to try so many coffees. fascinating! and here I thought that dark meant more caffiene! Opps. I love learning new things. I always call it “brew upon request.” I suppose that’s me being a rebel. “Demand” sounds so angry!! Lookin’ forward to part two of brew upon request. Oh my, the “more caffeine” conundrum. Ok, here I go. The roasting process causes coffee beans to lose a great deal of moisture, and, consequently, mass. Put simply, a dark, black oily bean will weight much less than a dry, chestnut brown bean (of the approximate same size). The roasting process also causes coffee beans to lose caffeine. The rate of loss is much higher for water than for caffeine. So, light roast = somewhat heavier than dark roast. Dark roast = minimally less caffeine content than light roast. Imagine a coffee shop where coffee was first ground, and then weighed into varying batch sizes (quarter, half and full). Now because darkly roasted coffee is significantly lighter than lightly roasted coffee, there would be physically more grounds present in a batch of dark roasted coffee than in a batch of light roasted coffee. Additionally, due to the fact that the loss in weight is greater than the loss in caffeine, the dark roasted brewed coffee would theoretically* (see note) contain MORE caffeine than the “mild” variety. Now imagine a different shop where coffee is ground and then portioned using a volumetric scoop. The scoop is leveled off with a straight edge each time so the portioned amount is approximately identical. A volumetric scoop of heavier (more dense) lighter roasted coffee will then consequently be heavier than a volumetric scoop of lighter (less dense) darkly roasted coffee. Therefore, the lighter roasted brew will theoretically* contain more caffeine than the volumetrically-dosed dark brew. *These mental gymnastics of physics assume an identical green coffee to start with. Different varietals from different origins, farms, and even different coffee trees will all produce varying levels of caffeine in their green coffee. Additionally, it assumes a stark contrast in roast degree, something that I believe Starbucks does not offer. The difference between Pike Place’s degree of roast and, say, Sumatra, is not great enough to warrant any of the complex thinking outlined above when walking into a coffee shop (or Starbucks) at 7am for your morning cup of coffee. The minimal advantage that any coffee-addicted person would gain with a few milligrams of caffeine, considering their assumed lowered sensitivity due to dependence, is dwarfed by the enjoyment that can be savored with finding a coffee that truly sings to you, that makes friends with your tastebuds, and that you will think about until your next cup. This is why I cringe when the topic even comes up, tell everybody to calm down, say “it’s too complicated for this early in the morning, you’ll be happier picking based on taste, and offer up some samples. One thing I forgot to mention– Before the launch of PPR we dosed by weight, not like we do now, which is by volume. To throw another factor into the mix, we now dose before grinding beans, which means bean size comes into play. Sumatran coffee beans are HUGE FATTIES compared to whatever secondhand source those PPR pebbles come from. I’d expound upon the potentials of this but quite frankly I’m worn out from the above novella. @Melody – what was your first Starbucks favorite? Mine was Kenya – I loved the black currant notes. I wish the coffee of the week changed daily and it varied from store to store. I like a lot of variety. Even though that in Canada we still have bold all day, I’d still like it to change more often. We’ve had nothing but Christmas blend on the brew since November 3rd. I’m so sick of it that I haven’t been to Starbucks yet this week. I’m brewing Verona at home. Speaking of the “lighter” roasts you alluded to… I still see them from time to time, but only rarely. Several weeks ago I saw Breakfast Blend available in a licensed store, and it seemed odd to see that instead of Pike Place Roast. Crema is right, but regardless, if you took 98% of an aspirin, would you worry that it wont work because of the missing 2%? If you drink coffee, any coffee but decaf, you’ll get a caffeine buzz. The difference in caffeine between roasts and blends is not in any way significant. Its just an urban legend of the coffee house that keeps getting told and told and told. There’s a related topic that I’d like to see you write about–that’s brewing at home. Basically we can do an “on demand” using a small French Press or a small batch and that works well for having one cup in the morning and then off to work, but what are the recommendations for when you want to brew a larger batch to enjoy over the next hour or so? When I first started with Starbucks, we had to grind all the coffee that we brewed. Eventually, we went to a model where the (then) Coffee of the Day choices were delivered pre-ground, in full batch portions. This was an amazing time saver, but was probably not very packaging friendly. The whole thing reminds me of my first job working at a theater. Our manager would have us fire up the popcorn popper just to get the aromas going. That’s what happened when we had the whole beans in bins instead of 1 lb. bags. (Reply to CD) – Hi there CD! In the early 90s, I remember Yirgacheffe being on the menu and being in love with that coffee. But I went through a time where I nearly forgot coffee. That’s hard to explain, but I’ve been through phases where brewed coffee seemed unimportant to me. Believe it or not, when Starbucks offered “malted” Frappuccinos I thought I was in heaven! Love the malted Frappuccinos. Sometime in about 2006 or 2007 I reconnected with the joy of the french press. I fell in love with Sanani pretty passionately. A press of Sanani made my day. The truth is, some great Starbucks baristas suggested some coffees to me, and the next thing I knew I was hooked. Though by about the middle of 2008, I stopped enjoying the French press very much when I realized that there was a new thing at Starbucks called the Clover. I discovered the Clover in January 2008, and by the summer of 2008 I was turning up my nose at a press, because the Clover seemed superior. Today, my favorite drip coffee varies with mood, but Verona has a special place in my heart. Of the more limited offering coffees, I really like Aged Sumatra, and Yirgacheffe, but it can really vary a lot too. What was your first favorite coffee? (Reply to Melody) I remember the Malt addition well. I also remember “add Power” back in the late 1990s. It was a protein powder that you could add to your Frappuccinos. It was before Atkins and before its time so it did not last, but I liked adding it to my Mocha Frap. Now, of course, protein is sort of back with the Vivannos but I haven’t actually tried to add it to a Frap. I do like the Vivannos and my kids love them. Kenya was the first Starbucks Coffee I think I ever drank and I loved it. It’s not my favorite today, but it still holds a place in my heart. One memory of Kenya is sitting in a Starbucks studying for my Torts exam drinking refill after refill of Kenya, which is probably one of my only favorable memories of Torts! I always liked the bolder coffees in the passport – which is probably why I took such a liking to Starbucks. Like you, I like Verona. I often use it as a replacement for Espresso Blend when I make espressos at home. I also really liked the Aged Sumatra they had last year in the special tins. Especially in a french press. Is the Sanini you are referring to the same as the Arabian Mocha Sanani? If so, I like that one too and am happy to see its return. Casi Cielo is a nice one to wait for each year and it makes a nice gift coffee as it tends to be one that most people have never experienced and most find enjoyable. There are no Clovers at the Siren here in Chicago so I tend to stick to simple espresso beverages, or if time permits, a french press with a friend. I pass on PPR. I work at a different corporate coffee shop, and we still do our coffees by what expires first–every store makes their own coffee brew calendar each week (its my favorite part of the week, personally!). We can adjust our bean orders based on customer preferences at our store. When we have one of our seasonal varieties out, we brew them on tuesdays and saturdays. Two coffees in the morning, one in the afternoon, always store choice. It means that although there are hundreds of these stores, they could be brewing any of our coffees at any time, and that makes me happy. (Reply @Catherine) Hi Catherine! That’s very cool to hear. We’re definitely talking about one area Starbucks could improve. I remember one time I went to a Clover Starbucks and saw Zambia Kasama on the drip brew – I asked about it and a barista said that they had a large amount of the bean about to expire and decided to brew through it. I thought that was a great idea!! I enjoy the change of pace. However, it seems that Starbucks would rather mark out expired bean than brew through coffee about to expire on their shelves – In my mind, this is definite a place where Starbucks needs to work on their coffee strategies. My first coffees brewed in a french press was Sumatra and Arabian Mocha Java. I still remember Emily making it for us and my friend Matt. It was pretty amazing! Drinking Aged Sumatra these days.